An F-35 FMS has been delivered to the Eglin ITC for F-35 pilot training. Lockheed Martin has delivered the first F-35 JSF full mission simulator (FMS) to Eglin Air Force Base’s 33rd Fighter Wing. 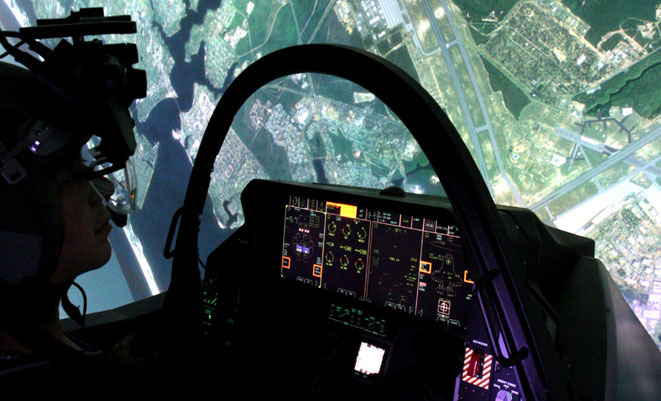 Featuring a high-fidelity 360-degree visual display system and a reconfigurable cockpit that simulates all three variants of the JSF, the FMS is designed to give F-35 pilots an accurate replication of the aircraft’s sensors and array of weapons. Vice Commander 33rd Fighter Wing, Colonel Arthur Tomassetti, said that the F-35’s “training technology brings a revolutionary new capability to the joint services”. Training with the FMS at Eglin’s ITC (Integrated Training Center) is due to commence in the northern autumn.